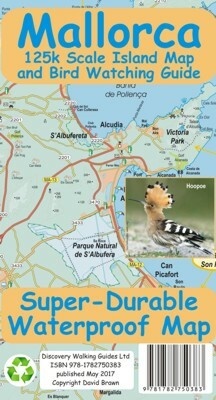 Mallorca Super-Durable Map and Bird Watching Guide combines the island map with a full colour Bird Watching Guide. Navigate to your destination then turn over your map to identify the birds you see there. Mallorca Super-Durable Map is a large (125k) scale topographical map of the island detailing all the major, secondary and minor tarmacked roads plus walking trails suitable for bird watching. Printed on a 840mm by 640mm Super-Durable map sheet which folds to a pocketable 220mm by 120mm using a specialist 'concertina map' fold which ensures easy opening, and more importantly easy refolding. Super-Durable Maps come with a 2 year adventurous use wear and tear guarantee, see Discovery Walking Guides website for details. Altitude background colouring clearly shows the altitude range when travelling around the island. 100 metre contours compliment the altitude colouring along with a large number of individual height points. Our useful symbol range includes miradors, picnic areas, petrol stations, bar/restaurants and parking areas where you can pull off the road safely; plus all of Mallorca's golf courses. All of the suggested Bird Watching Sites are clearly highlighted along with the top beaches from Tripadvisor. Mallorca Bird Watching Guide is on the reverse of the map sheet detailing 51 bird species complete with full colour picture, ID Guide, characteristics and location, for all of the species featured. Suggested Bird Watching Sites are detailed and these are highlighted on the map sheet. Simply use the map to arrive at your bird watching site of choice, then turn the map over to start identifying the birds you see at that location. Mallorca Bird Watching Records Sheets are available as a free pdf download from the Discovery Walking Guides website along with gps waypoint files for all of the Suggested Bird Watching Sites in a range of file formats including Points of Interest (POIs) for SatNav users. In use maps have a very tough life so you will appreciate our specialist concertina map fold that allows you to quickly open the map, and more importantly fold it back up to its pocket size after use. Our Super-Durable Maps are printed with 100% oxygenation inks on Polyart which produces a map that feels like silk but will stand up to the roughest treatment of outdoor adventuring and yet fold up like new at the end of your adventure.